Riding home on the bike I spotted what looked to be a shortcut that until then I had never before noticed. It looked like a good way to avoid some road traffic. So off I went into the unknown, down the brick path. It’s funny, you’ve lived in an area for years and suddenly, it’s as if new territory opens up in right in front of your eyes – a rip in time and space. How fitting that, just then, something colorful against the dark brown earth caught my eye. A small stack of pulp magazines wrapped together with a “motz” magazine. Hmmm, this was ‘otherworldly’ indeed – and definitely from a different era. I spread them out to look at them. The list price on the cover is in DM (open a bigger version of the photo in a separate window and you can read it for yourself). So these rags are least 10 years old, and in fairly good and absolutely dry condition! Just lying there. 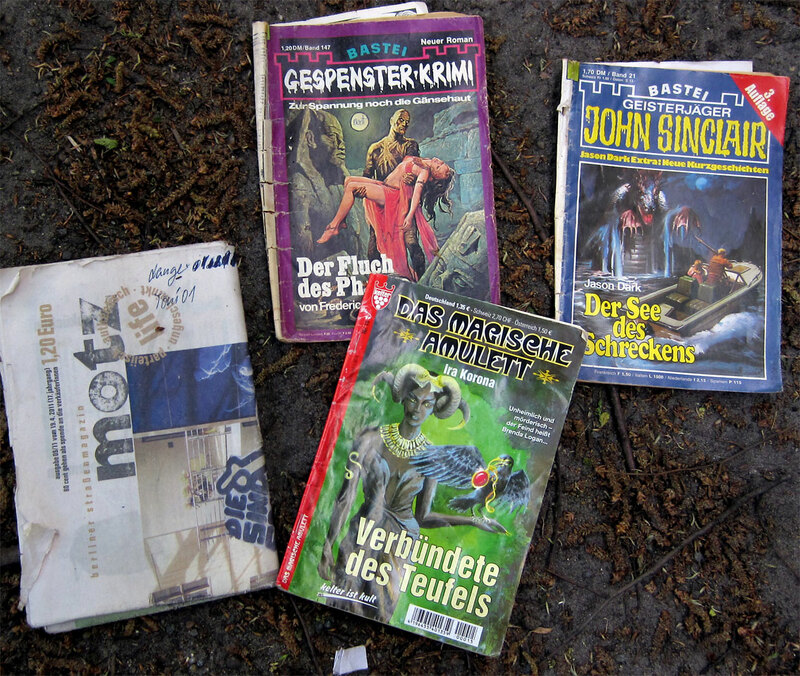 Today I looked the titles up in the internet – publishers Bastei Verlag put out ‘Gespenster-Krimi’ from the mid-1970’s to the mid-1980’s. I didn’t pick them up or move them. I just left them – not quite as I had found them, but still, at least, on the same spot. And they may yet be there still, in that parallel world, waiting for the next reader – or the next bike rider – to discover them.